The Greendale Station playset comes with an articulated Ajay Bains figure. Ajay is the Greendale stationmaster and Greendale Rocket driver. 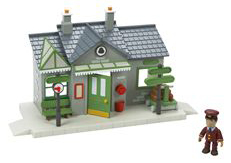 Like the other Character playsets, the station is fully reversible; both sides offer good playability and several features. The station door opens and closes. The hands of the clock move. The set includes a little wagon for pulling parcels along the platform.